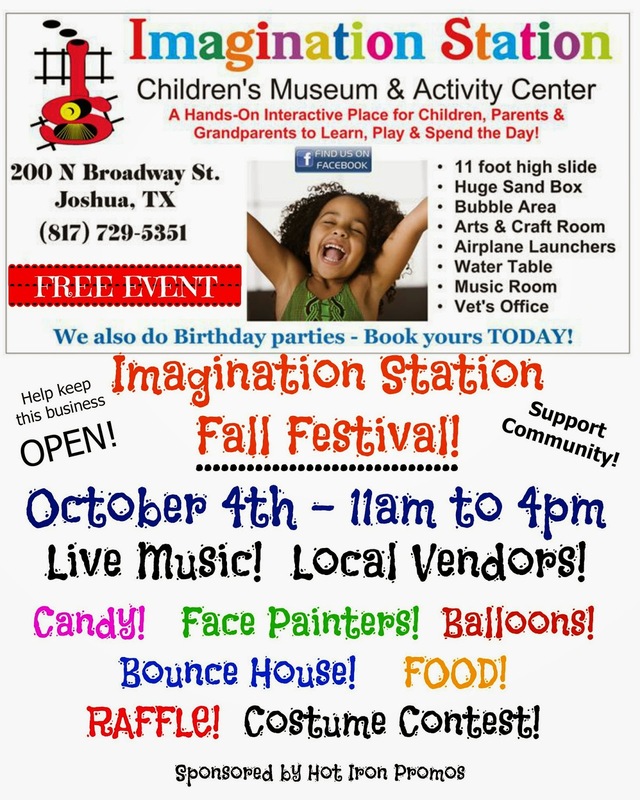 "Imagination Station is a hands on old fashion kids museum, offering good old fashion FUN! Although this is an amazing place and so much needed in the small town of Joshua, not to mention Johnson County, as an affordable place parents can bring their children, because they are a best kept secret ... financial hardships have hit them, and they risk having to close the doors. So we are rallying the community to come together and show their support to help get them noticed, and to spread the word - so more parents and children in the area can come see just how fantastic Imagination Station really is! So, come on out the day of this open house and tour for FREE - visit the Bubble room, try out the 11 foot slide, play in the HUGE sandbox and play Dr. in the Vet Office.... Come listen to some amazing local artists that have come together for the cause, and shop local small businesses and vendors that will be there as well! Live music, Vendors, Food, Cotton Candy, Popcorn, Face Painting, COSTUME CONTEST, Bounce House... and MUCH MORE!" Raffle items required. All proceeds go to the cause. Applications are available here and are due by September 30, 2014. For more information, visit their website or contact their event coordinator at robin@hotironpromos.com / 817-889-7937.